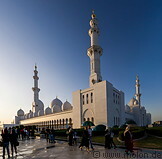 The white Sheikh Zayed Grand Mosque is the most characteristic landmark of Abu Dhabi. It is located at the southeastern end of the Abu Dhabi island, close to the Al Bateen exwcutive airport. 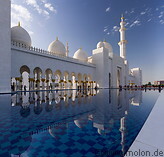 It is the largest mosque in the United Arab Emirates and the third largest in the world. 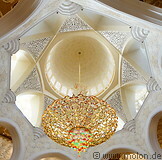 The mosque was constructed between 1996 and 2007 by 3500 workers at a total cost of AED 2.5 billion. 33000 tons of steel and 250000 m³ of concrete were used. 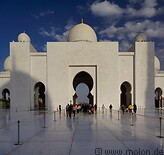 The mosque complex covers an area of 22412 m² and has 82 domes. The mosque can accommodate 41000 worshippers, of which 7126 can find place in the main prayer hall. The inner courtyard is lined by 1048 columns. Several types of Marble were used for the construction. 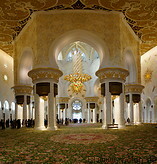 The carpet in the main prayer hall measures 5627 m² and is the world's largest carpet.